Affinity purified phospho specific peptide. HEK293 cells were incubated for 1 hour with (+) or without (-) 2 uM PD 184352 or 10 ?M U0126, then stimulated for 10 mins with 100 ng/ml EGF (Upper panels) or 100 ng/ml PMA (lower panels) and lysed. Cell extract (60 ug protein) was denatured, subjected on SDS/PAGE and immunoblotted with anti-EWS phospho Thr 79 (S423B) or anti-EWS (S418B). Note: that in the lower panel phorylated EWS runs just above a non-specific band as indicated. 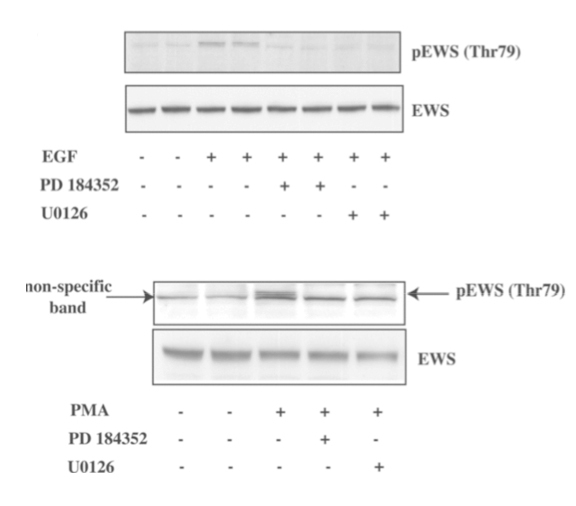 Phosphorylation of Ewing's sarcoma protein (EWS) and EWS-Fli1 in response to DNA damage.